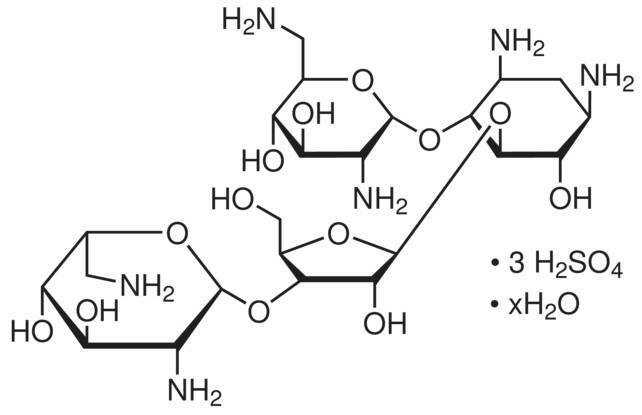 Neomycin is a broad-spectrum aminoglycoside antibiotic isolated from Streptomyces species. It targets gram-negative and gram-positive bacteria. Neomycin can also be used as a selection agent for prokaryotic cells transformed with the neo gene or NPT II resistance gene and to study toxic antibacterial side effects. In addition, neomycin is a calcium channel protein inhibitor and DNase I inhibitor. It can be used in a variety of cell culture applications. In addition to its use in antimicrobial susceptibility testing, neomycin sulfate is used for food testing in TSN agar to select for Clostridium perfringens. It inhibits growth of Enterobacteria and Clostridium bifermentans. Neomycin can be used to negatively select for plants transformed with plasmid containing Agrobacterium mediated transformation resistance and to cells containing pcDNA3 resistance plasmids.